One of the many benefits of growing up in a warm climate is the option of eating outdoors on a regular basis. My mother made dinner for our family almost every night of the week and we ate it together, not in front of a television. As spring arrived each year and daylight extended a bit further into the evening, it would come time for my brother or I to set the table and my mother would ask, “are we eating inside or out tonight?” My answer was always, “out!” and if I could get outside fast enough, before any other family member had the chance to object, I would set our patio table and light the citronella candles to try and keep the bees away. I’m not sure why I loved eating outdoors so much. Perhaps it was a change from the usual or maybe, even at a young age, I appreciated the amazing view of the Angeles Crest National Forest visible from my parents’ backyard. I couldn’t have known then that they wouldn’t live in that house forever and that I needed to make the most of the surroundings while I had the chance; luckily, I did it anyway. I continue to love eating outdoors though I rarely get the chance to entertain in my own backyard. Busy schedules and the absence of my own family to cook for every evening mean eating outside is relegated to Saturday evenings and only then if I can round up a group of friends to come over for a BBQ. Since the time change has already happened this spring and the sunlight hours are once again extending further into the evening, I need to make sure that my propane tank is full and ready to BBQ. Of course the first question that comes to mind and perhaps should not be addressed so late in this post is what to serve? I love making skewers for picnics and BBQs. They can be prepared in advance and grilled on the spot or if you’re headed out on a picnic they can be cooked in advance and served at room temperature. Even more importantly, you don’t need silverware. Simply put, meat on a stick is easy outdoor food. When meat on a stick is made with Greek flavors, it is often referred to as souvlaki or shish kebab, but still, at its base, it is meat on a stick. This recipe for Pork Souvlaki is marinated the night before so when it comes to cooking, all you have to do is skewer and grill. The accompanying honeyed apricots can also be prepared ahead, making the work when your guests arrive an exercise more in plating than in cooking. Cooking note - Finding myself without a bottle of wine in the house, I substituted champagne vinegar for the wine, reducing the amount by two thirds. If you prefer to use wine, I’ve included the original amount called for. If you do use vinegar, be ready for a bit of a sour bite to the apricots, a bite that I found to be perfectly balanced by the Greek yogurt served on the side. For the Pork: Combine the shallots, garlic, oregano, jalapeno, lemon juice, olive oil and pork in a large Ziploc bag and turn to coat. Marinate overnight (or at least three hours if you don’t have that much time). For the Apricots: Combine the lime juice, wine or vinegar, honey and shallots and bring to a boil. 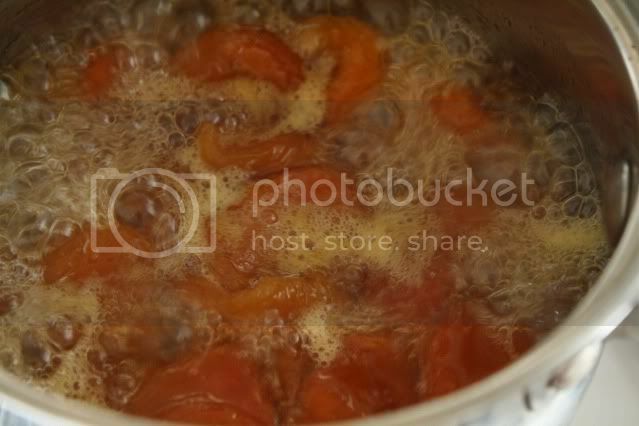 Add the apricots and simmer the mixture until syrupy, about 15 minutes. 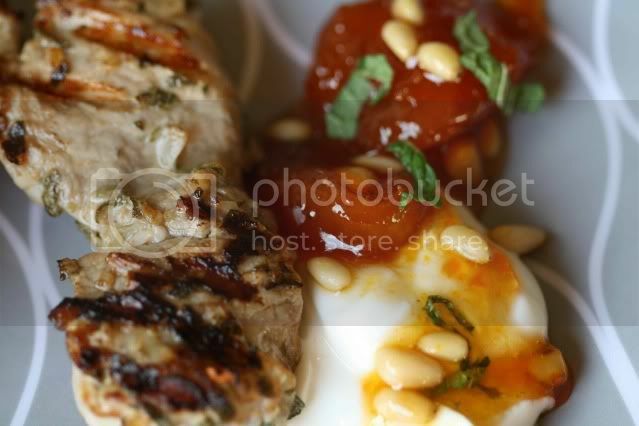 Remove from the heat and stir in the mint and pine nuts. For the Pork: Soak 16 wooden skewers in water for half an hour if you are using a BBQ. If you are using a grill pan then there is no need to soak the skewers. Place two pieces of pork on each skewer, sprinkle generously with salt and cook over high heat until cooked through, about two minutes per side. 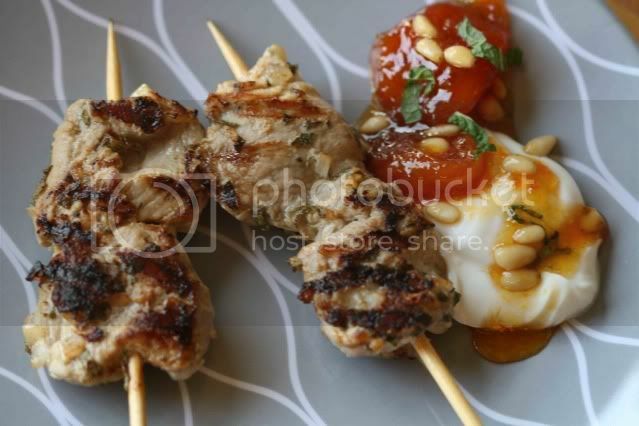 Plate 2 to 3 skewers per person and serve with a dollop of yogurt and 2 to 3 apricots. This looks and sounds delicious and would be a nice change from the normal barbeque dinners we make for Father's Day, for instance. Will have to bookmark this one. This definitely capturd me, especially when you threw out the words "honeyed apricots". My eyes widened and all I wanted was to sink my fork into it right now! This looks fabulous! I don't have a grill or grill pan, but I'm sure my broiler will do the trick. Thanks! This is a great post! I like getting a glimpse of the person behind the blog. And the pork and apricots look divine. I enjoy eating outside too, although in San Francisco that happens about once a year. Much more when I lived in L.A.
Ooh lovely, I can't wait for the weather to be better so that we can start eating outside again - maybe in a month we should just be about there. Having a backyard is one of the things I miss most about the United States. Hi there, I envy you being able to eat outdoors as I don't have a yard or garden; it makes me think of holidaying in Italy and somehow makes the meal just that little bit more special. These look so delicious and I absolutely love Greek food. Holy Yum!! this is got to be one of my favorite dishes!! I can't wait for backyard bbq's!! Nice blog, you soon then! I am with you in loving to eat outdoors! And, it's typically a great way to save energy if we cook outdoors as well. Indoor cooking tends to raise the indoor temp and force the AC to work harder. My husband will love this dish. It looks delicious.I want to eat.i will have a try.